This very colorful petrified Araucaria wood plank is a true museum piece with a particularly unusual and quite beautiful special feature! It is “rip cut” (cut with the grain) from a well preserved conifer tree and is one of the larger and more visually stunning examples of this type of display specimen I’ve personally ever seen, let alone produced! It’s a breath taking example of how beautiful petrified wood can be! The wood grain is just amazing and features a particularly colorful, highly agatized display of banded color in the mirror polished face! If you look closely, you’ll see a purple and red fortification agate pattern stretched through the bands in the lower right corner of the first photo. This is uncommon in any petrified wood but particularly so in Arizona. I don’t think I’ve ever seen a rip cut slab show one of these before. It’s a true collectible natural artwork! The depth and richness of the color are hard to extract from the photo, but in person it’s just almost unbelievable that it could be completely natural – but it is! This stone is polished to the same museum quality finish all of our work is prepared with and it truly represents some of the best of what Sticks in Stones Lapidary can provide to collectors and natural art lovers everywhere! This unique presentation could be used as a beautiful display of natural art, or put to work as a serving platter or small table top. I don’t often get top grade examples of petrified wood from Arizona and what I do see is usually table top size and not very easy for a collector to display. This particular log is an exception to both rules. I didn’t find it, but I sure wish I had! It’s one of the better preserved medium sized petrified wood logs I’ve seen from that state and deserves a place in your collection as well. Most of the petrified logs found in this particular area are Araucaria, and the structure in this one is consistent with those. If you’re new to our shop the one thing you should expect is to see an unexpectedly glossy finish on each stone we prepare. This completely natural fossil stone is a wonderful example of the best lapidary work you’ll find anywhere. It’s been cut with a diamond saw and flat lapped on equipment I built myself to produce a mirror perfect polish unmatched by any of our many would-be imitators. The detail captured and revealed through the highly polished surface is just immaculate. It’s easily some of the best Arizona wood to be found anywhere! The rings are gorgeous, the agate is highly polished and the detail is easier to see in person than the photo suggests. It’s a truly special find and we won’t likely have a lot more so get a piece for your collection while it’s available! This stone has been professionally polished on a special lap that produces a flat face and a mirror perfect shine. The polish really is liquid perfect – a difference in the quality products Sticks-in-Stones has built its reputation on! This giant sized slab measures about 11 1/2″ x 7″ across the mirror polished face. It is cut about 0.55 thick. Weight is about 5.34 lbs. 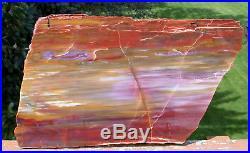 A nice, unique naturally wonderful stone collectible exclusively from Sticks-in-Stones Lapidary. 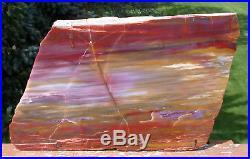 The item “SiS 11+ Arizona Rainbow Petrified Wood Slab STUNNING RIP CUT PLANK” is in sale since Sunday, October 14, 2018. This item is in the category “Collectibles\Rocks, Fossils & Minerals\Fossils\Vegetation\Petrified Wood”. The seller is “rockshop” and is located in Beaverton, Oregon. This item can be shipped worldwide.